Days of heavy rain have caused severe flooding in northern Italy. An elderly fisherman died in the Liguria region. At least two others are missing in northern Italy, another in Sicily, where flooding has also caused damage and disruption. One of those who disappeared is a man of around 70 years old who was trying to save his horses near Turin. The River Albona burst its banks, sweeping him away into the water, according to accounts quoting his son. The Liguria and Piedmont regions, have been particularly badly affected and on red alert for flooding since Thursday. A state of natural disaster has been declared, paving the way for national funds and resources to be deployed. As rivers broke their banks, in Turin two tourist boats were swept away from their moorings, until their path was barred when they crashed into a bridge. The prime minister visited the city where the flooding has caused havoc. In northern Italy bridges have been closed, roads blocked, cars carried off by the floods, and hundreds of people evacuated. Fed by swollen water levels in the Italian Alps, the River Po – which crosses the whole of the north of Italy – has also exceeded its alert level. 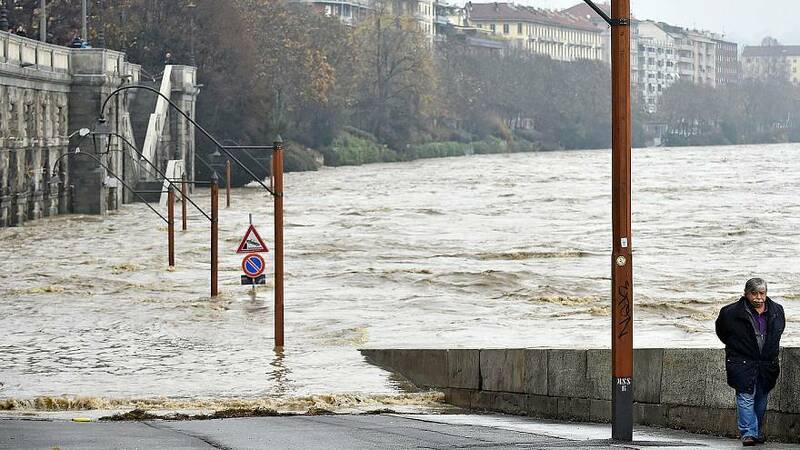 The authority responsible for managing the river has predicted that water levels in Turin and the surrounding region will remain critical until the middle of the day on Saturday, before beginning to go down gradually.